Few filmmakers have made such a small number of feature films as Quentin Tarantino and achieved the same distinctive reputation. This is only Tarantino’s seventh solo effort behind the camera, and it’s immediately recognizable as such. While his first films, “Reservoir Dogs” and “Pulp Fiction,” were heavy on violence but less stylized, Tarantino has established a new model that worked superbly for him in “Inglourious Basterds,” to plant absurd characters in a historical setting and see what might have happened if they actually existed. While entertaining, “Django Unchained” is an exercise in ridiculousness, no longer tethered to reality in the way that his previous films managed to be. 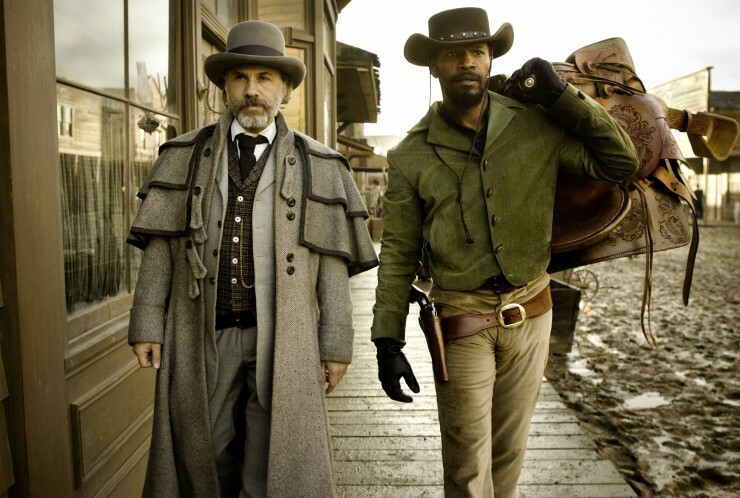 “Django Unchained” opens with Dr. King Schultz (Christoph Waltz), dentist by certification, bounty hunter by trade, coming across slave traders in the middle of the night and arranging for the purchase of Django (Jamie Foxx), who Schultz needs to help him identify his latest bounty. A friendship quickly evolves between the two men, a definite odd couple for the 1858 South, and Schultz soon offers to help Django track down his wife (Kerry Washington) and secure her release. Their subsequent meeting with the illustrious Calvin Candie (Leonardo DiCaprio) leads to further shenanigans, and, expectedly, much more bloodshed. There are several scenes within “Django Unchained” that remind why Tarantino is revered, not for his unapologetic borrowing of music, styles, and even names from his favorite films (“Django” is a 1966 Western film with a similar plot), or his penchant for explosively bloody violence, but for his ability to create magnificently tense, breathless scenes that creep up on the audience, revealing themselves sometimes only moments after comedic occurrences. Those scenes, however, are overshadowed in this film by outright comedy, which proves distracting and tiresome, especially after two hours and forty-five minutes. For instance, white supremacists spend a full five minutes moaning about the small holes cut into the masks they are set to wear before a raid, a wholly unnecessary and futile focus for a film with more important goals. The cast in “Django Unchained” is what makes it worth seeing. Waltz, who won an Oscar for his debut American role in “Inglourious Basterds,” makes the screen his own, talking his way through peculiar moments and making them utterly mesmerizing, and usually hilarious. While he’ll likely never have a role as perfect as Hans Landa, Tarantino definitely knows how to use him well. Leonardo DiCaprio also gets a fun opportunity to play a villain, embracing Tarantino’s delight for maniacal bad guys. Foxx and Tarantino favorite Samuel L. Jackson both hand in decent performances fitting for their material, and the crowded ensemble contains many familiar faces in amusing small parts. Tarantino managed to modify history and craft an engaging, fascinating film out of “Inglourious Basterds,” but that’s just not the case here. Schultz, for all of Waltz’s film-carrying abilities – and they should not be minimized – doesn’t fit at all with his surroundings, and that fact makes it hard to accept “Django Unchained” as anything other than absurd. The excessive violence is only occasionally effective for the sake of the story, and it does seem that Tarantino is getting carried unnecessarily. If more effort was put into stylizing the non-violent parts of “Django Unchained,” it might have been a stronger, more even film.